The object that looks like a fourposter bed in wrought iron to your left is over the tomb of Mrs Stisted, the 'Queen of Lucca'. It almost had white curtains of snow that night! To your right you can see Arthur Hugh Clough's tomb, while on the left beyond the cross is Elizabeth Barrett Browning's. We are in the midst of forming a Foundation under Italian law to protect the English Cemetery. The Aureo Anello Association will continue for library members and as 'Friends of the Cemetery', but lacks the clout to convince Foundations to take us seriously. We were threatened with closure again a few days ago. Despite this, there has been much generosity, people buying our marbled-paper limited editions of Elizabeth Barrett Browning's Sonnets and Ballad and Amalia Ciardi Dupré's 'Clasped Hands' of Robert and Elizabeth, as well as donations to Aureo Anello. We shall need funding from Foundations or the Regione or both to stabilise our hill and wall, but apart from having the expert Alberto Casciani to advise us it may be possible to do much of the tomb restoration on a voluntary basis. Since this summer we have our curving handrails, for which Aureo Anello raised 1000 euro, and which allow all to enter our cemetery. Being international and ecumenical, we find we need to write to each nation which has burials in our Swiss-owned, so-called 'English' Cemetery in Florence. The first essay is to England, followed by the essay to America, then by the essay to Switzerland, then that to Russia. I am writing to you because this summer the world-famous and very beautiful 'English' Cemetery in Florence, where Elizabeth Barrett Browning, Walter Savage Landor, Arthur Hugh Clough, Fanny and Theodosia Trollope, friends of Florence Nightingale, participants in the Battle of Waterloo, and many others are buried, was threatened with closure and abandonment. The PreRaphaelites William Holman Hunt sculpted the tomb of his wife Fanny and John Roddam Spencer Stanhope sculpted the tomb of his daughter Mary, that lie beside that of Elizabeth Barrett Browning by Lord Leighton. Members of the Royal Family found burial here, among them Charlotte, Countess of Strathmore and Kinghorn, and a natural son of King William. Mary Somerville, who taught Lord Byron's daughter Ada Lovelace mathematics, and thus being responsible for the IBM computer, buried her husband William here. Sir Franco Zeffirelli filmed Tea with Mussolini here with Dame Judi Dench memorializing Elizabeth Barett Browning. Opponents of slavery are buried here and among the friends of Florence Nightingale here is Thomas Southwood Smith, grandfather of Octavia Hill, and advocate of fresh air and sunlight in the home, recorded so on his tomb in Leigh Hunt's epitaph. His teachings would lead to a lessening of the deaths of women in childbirth and of small children. The land for the Cemetery had been bought by the Swiss Evangelical Reformed Church from the Grand Duke of Tuscany in 1827 for the burial of non-Catholics, whose bodies earlier had to be transported to Livorno, and the Swiss Church gave free burial to impoverished English travellers who died here as well as to poor Swiss church members. In 1877 the medieval wall against which it nestled was torn down, it was reshaped as its present oval island and then the so-called 'English' Cemetery was closed and abandoned. For over a hundred and twenty five years the Cemetery has been neglected. But it was for fifty years before that an fragrant garden with roses trained on wrought iron arches, strawberries on the graves, myrtle, laurel and lavender, beneath its great cypress trees. It is our hope to restore it as it was through the careful study of old photographs, paintings, writings and oral history. Five years ago it was re-opened to the public and a library, workshop and exhibition space placed in its Gatehouse. The library is open to readers who give it a book a year and it particularly collects books by and about the persons buried here, scholars frequently using these in their research. The workshop carries out stone restoration, book-binding, paper marbling, replicating nineteenth-century handcrafts in the style of William Morris, and runs apprenticeship programmes in these areas. 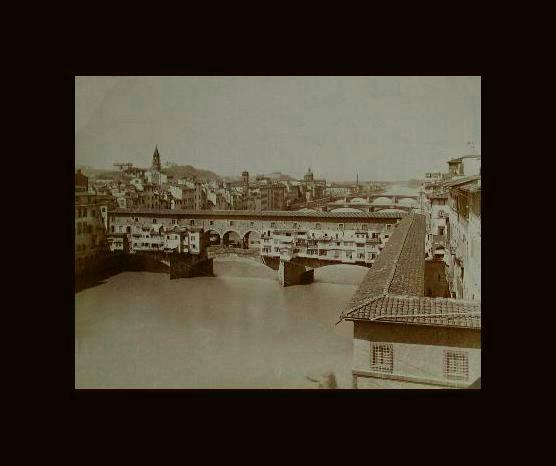 The exhibition space displays a fine collection of sepia photographs of Florence and first-edition books by and about Elizabeth Barrett Browning, Walter Savage Landor, the Trollopes, Anna Jameson, Isa Blagden, Kate Field and others. Each book received is given a book plate with the donor's name, city and date, so donors, as well as the persons buried here, will have their name remembered by others. Cemeteries are archives, data banks, from the past to the future, about human lives. For instance, two cousins came to see their ancestress' tomb and then arranged for its restoration. The curator asked her story. Sarah McCalmont had died in childbirth, but her child had lived and her Church of England clergyman husband had brought this orphan home to England, the baby becoming their ancestor, too. The curator asked for a picture of her. The cousins sent a photograph of a portrait of a young beautiful woman straight out of Jane Austen. The monuments in marble on pietra serena bases range from the earlier neo-classic, for instance, anachronistic cinerary urns on columns, and often making use of Egyptian hieroglyphs, to the later Victorian realism, particularly shown in the statue of Walter Savage Landor's wife on their son Arnold's grave, as far away from and her back turned to her poet husband's grave, which shows her with wedding ring, bobbled shawl, knit scarf, in utter grief. When Elizabeth Barrett Browning died, the City of Florence placed a plaque on Casa Guidi, in Via Maggio, where she had lived and wrote, stating she made of her poetry a golden ring, 'un aureo anello', between Italy and England. Robert then used that for the title of his The Ring and the Book. The Associazione Aureo Anello Biblioteca e Bottega Fioretta Mazzei e Amici del Cimitero 'degli Inglesi' (Golden Ring Association: Library and Workshop Fioretta Mazzei and Friends of the 'English' Cemetery), supports the library, runs international conferences in Florence on 'The City and the Book', and raises fund for the restoration and landscaping of the 'English' Cemetery. Initially an 'English' Cemetery in Florence Foundation was proposed, but the Swiss owners chose to work with the Aureo Anello Association and the City of Florence and the Region of Tuscany governments, within Italian legal frameworks. Donations may be received by the Swiss Evangelical Reformed Church in Florence or by the Aureo Anello Association and will be used entirely for the Cemetery's restoration. Our visitors come from every country, our tombs' inscriptions being in many scripts and many languages; for though the English are in the majority, also buried here are Swiss, Russians, Americans, Greeks, Scandinavians and many others, at a time when Florence was a haven for great creativity. While the Americans who found burial here later often had themselves shipped in lead to be buried in the States, amongst the English there is the sense that where we lie is forever England. Partly for this reason the Italians call this oval in the Piazzale Donatello, the 'English' Cemetery. It is an island of Englishness far from home, an English and a world monument, in Florence. Our guest books fill up with signatures from everywhere; likewise the petition that the Cemetery be kept open, be restored and be declared a UNESCO World Heritage Site. The Cemetery has an extensive website, cataloguing the tombs and the books, and in this way acquiring further information and materials, descendants writing from Africa, from Australia, from America, from England, adding to the fine archives that are accumulating and ongoing, as well as a weblog and a petition. The 'English' Cemetery in Florence either has to be abandoned by the Swiss owners or restored and shared by the English and the Swiss as a heritage for all the world. Its present condition is an actual danger to visitors. If it can be restored, with help from the private and international sectors as well as from the city and regional governments in Italy, it can again be opened as a working cemetery for the burial of ashes, though no longer bodies, and in this way become economically viable and also once more a place of great cultural value, to Florence, Italy, England and the world. Like its companion, the Protestant Cemetery in Rome, it is a shrine to poetry and sculpture, to literature and to art, and it is as well a monument to the abolition of slavery and serfdom, and to better world health and hygiene, to our longer lives and greater freedom. This Cemetery in Florence is a way of studying the history in exile of Americans, British, Russians and Swiss. We seek your help in saving this treasure. 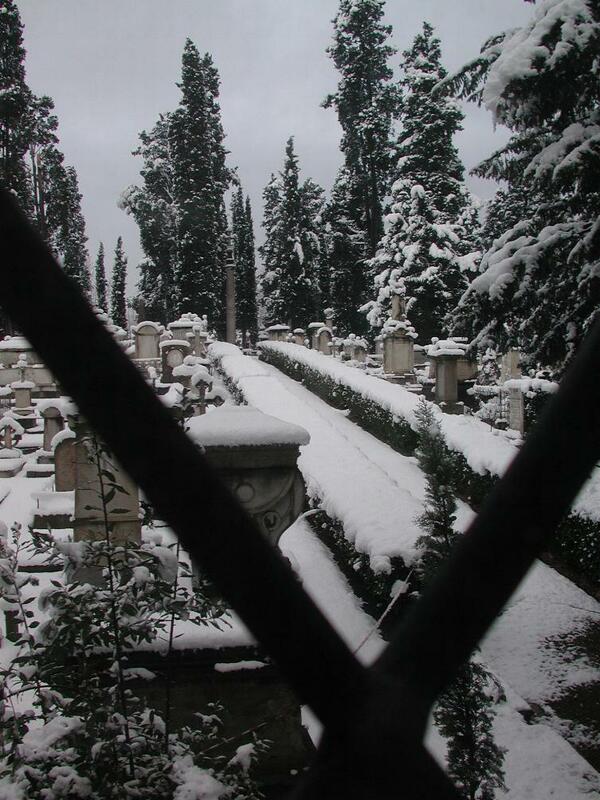 The very beautiful Swiss-owned Protestant and Orthodox Cemetery in Florence was first bought from the Grand Duke Leopold II of Tuscany in 1827. The Cemetery was then closed in 1877, following 50 years of intense use, when the medieval city wall was torn down, following which it could only be used for the burial of ashes, not bodies. Some of the American burials precede its closure, others, of ashes, were later. Quite often, Americans had themselves buried in lead, to be shipped to the States later. These fifty years were a time of great cultural energy for the Florence of the Risorgimento, briefly the capital of Italy, in which Americans, as well as English and Russians participated fully. Sculptors like Hiram Powers and Joel Tanner Hart came here. Anti-slavery advocates like Theodore Parker and Richard Hildreth came here, there also being buried here the black Nubian Nadezhda (Hope) who came to Florence at 14 with Jean-François Champollion and Ippolito Rosselini's 1828 expedition, funded by the Grand Duke, her story being told on the marble of her tomb in Russian in Cyrillic characters, while Lord Leighton sculpted a broken slave shackle on Elizabeth Barrett Browning's tomb, for her family had been slave owners in Jamaica but which she passionately hated, writing her famous sonnet on Hiram Powers' 'The Greek Slave', the sculpture that had been at the centre of the 1851 Crystal Palace Exhibition and 'The Runaway Slave at Pilgrim's Point'. and The Autobiography of Henry Adams describes this in his 'Chaos' chapter. Not all Americans who visited Florence came to be buried here but these tombs record their friendships: Henry James was to write of Isa Blagden; Nathaniel Hawthorne having written of Isa Blagden and Theodosia Garrow Trollope in his Miriam in The Marble Faun; and Sophia Hawthorne of Hiram Powers and Elizabeth Barrett Browning, in her Diary; while Margaret Fuller was likewise Elizabeth Barrett Browning's friend, and who becomes the eponymous heroine of Aurora Leigh, complete with the Brook Farm phalanstery in the nine-book epic Elizabeth wrote following Margaret's drowning with her baby and Italian husband off Fire Island, Emerson sending Thoreau to look for their bodies. 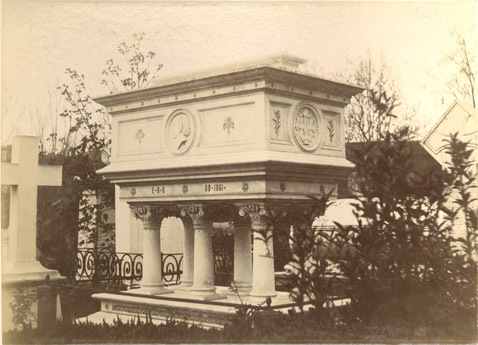 A photograph of Elizabeth Barrett Browning's tomb by Lord Leighton would be treasured by Emily Dickinson and this and Aurora Leigh be alluded to in her 'The Soul selects her own society' and other poems. In this pre-1870 postcard photograph one can see the medieval wall as still present, outlining the cross John Roddam Spencer Stanhope sculpted for his daughter's tomb, and the ark William Holman Hunt sculpted for his wife. Poignantly, many American babies are buried here, Italy being then subject to diseases like malaria, about which Henry James wrote, though several of Florence Nightingale's friends find burial here, including the physician Southwood Smith in a tomb with a medallion sculpted by the American Joel T. Hart, and the epitaph by Leigh Hunt that he advocated 'fresh air and sunlight in the home/ of the rich poor of happier years to come'. Many Americans and an Englishman have helped make this web essay possible: Jeffrey Begeal, Carolyn Carpenter, Philip Henderson, Robert J. Robertson, Naomi Slipp, Don and Mary Williamson. The Swiss and the English thank them. The very beautiful Swiss-owned Protestant and Orthodox Cemetery in Florence was first bought from the Grand Duke Leopold II of Tuscany in 1827, then closed in 1877 when the medieval wall was torn down and it became within the city limits of Florence and therefore illegal for burial. 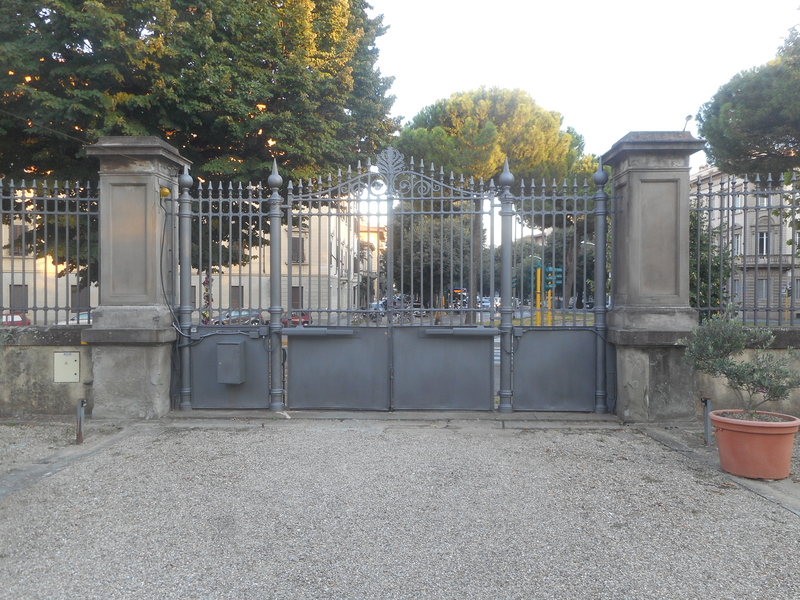 Its official name is the Cimitero Porta a' Pinti for that gate had been in what is now Piazzale Donatello. The original cemetery, from 1827-1869, was designed by Carl Reishammer to nestle against the wall at the Porta a Pinti, the Pinti Gate, itself first built by Arnolfo da Cambio, then reconstructed by Michelangelo, gave this appearance. Later, Giuseppe Poggi incorporated it as an oval island with its tall cypresses within his great viali, now so filled with traffic. It had this shape when Arnold Böcklin buried his seven month-old daughter Maria in this 'Island of the Dead', the 1860 Gatehouse reflecting the Egyptological studies of Jean-François Champollion and Ippolito Rosselini's Expedition to Egypt and Nubia funded by the Grand Duke in 1828. The painting would inspire the Opus 29 of Sergei Rachmaninoff. The two stemma, with the lily of Florence and the cross of the Guelf party (like the Swiss cross), were removed from the demolished Arnolfo di Cambio and Michelangelo gate and placed on the back wall of the Cemetery. In the nineteenth century the area was an English garden with box hedges, roses trained on the iron arches above the babies' tombs, and rare plants that flowered joyously in the Spring, while family members would plant myrtles and laurels on the tombs of their husbands, wives and children. The Cemetery is international and ecumenical. Its tombstones have verses from the Bible in Hebrew, Greek, Russian, German, French, Italian, Rumantsch and English and in Hebrew, Greek, Cyrillic, fraktura and Roman script, this at a time when Catholics were forbidden to read the Bible in their vernacular languages. Today even Catholics may have their ashes buried here and even Catholics, following Vatican II, read the Bible in Italian and other languages. Many babies are buried here and many women who died in childbirth, but friends of Florence Nightingale also found burial here and shared with Henri Dunant the concept of medicine as a human right. So this Cemetery was prophetic of our future, of a greater freedom, of religion, of health. 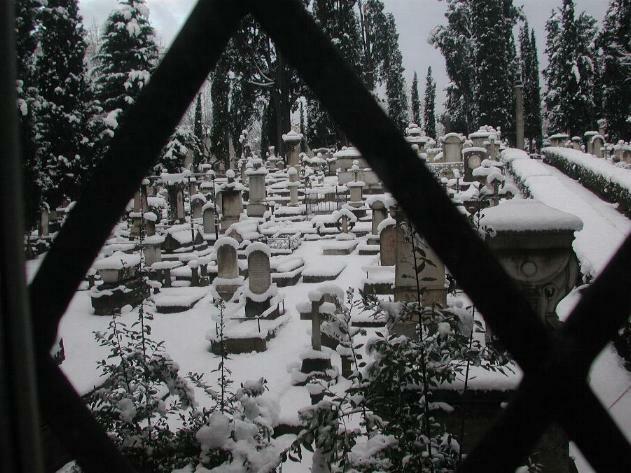 This Cemetery is filled with the tombs of great writers and artists, and also of ordinary people, Russian serfs, English servants, Swiss pastry cooks, and even the tomb of Nadezdha, a black Nubian slave brought to Florence at 14 with Champollion and Rosselini's 1828 Expedition to Egypt and Nubia, whose story is told in Cyrillic on her very beautiful marble tombstone of a Russian Orthodox cross, for she was baptised into that faith, while other tombs are of individuals who preached, wrote novels and wrote poems against the evil of slavery. The Swiss were already present in Florence from the second half of the eighteenth century; prior to 1827 they had to be buried in Livorno. 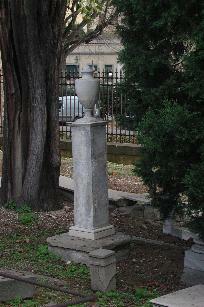 The Florentine Evangelical Cemetery's first burial was of Jean David Marc Gonin, whose tomb shows a handsome romantic young man on a column. Following him, its Swiss occupants include Giampietro Vieusseux, who founded the Gabinetto Vieusseux, free from the Grand Duke's censorship, where Robert Browning, Fyodor Dostoievsky and John Ruskin could be readers, but not, for being a woman, Elizabeth Barrett Browning, and Jacques Augustin Galiffe, the historian of the school of Jean-Charles-Léonard Simonde de Sismondi. 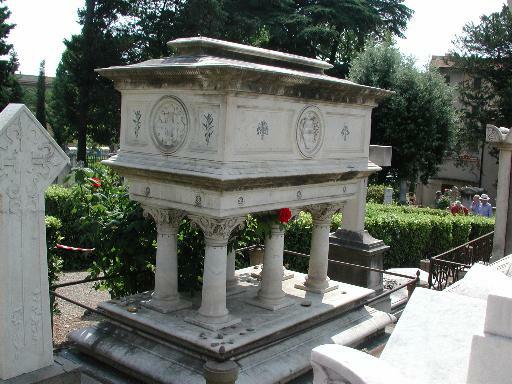 While Elizabeth Barrett Browning, the most world-famous figure buried here, was deeply influenced by the Swiss Madame de Staël (Anne Louise Germaine Necker, baronne de Staël-Holstein), using her Corinne ou Italie for the plot of her nine-book epic Aurora Leigh. An entire section of the Cemetery houses the tombs of members of the Wital family, one of them having been the Cemetery's Inspector and whose sculpted bust still surveys the surroundings, while his weeping widow and orphan in classical garb, in marble, are shown forever placing a garland on his grave. Other figures also cluster in that top right sector but are as well to be found throughout the Cemetery. Hardworking and devout, they were often pastry makers or involved in straw weaving. They gave free burial to the paupers of their own Evangelical church and also to foreign destitute travellers as an act of charity. Probably the only shameful Swiss figure is Julia Thuillier, the daughter of a bankrupt Swiss banker, and wife of Walter Savage Landor, who threw him out of the Villa in Fiesole he had given them. She is shown magnificently, ostentatiously sculpted in marble weeping on her son's tomb, her back turned to that of her husband's modest tomb beneath a laurel for his splendid poetry at the opposite side of the Cemetery. Particularly the tomb inscriptions of the Swiss families are in multiple languages, German, French, Italian and Rumantsch. Televisiun Rumantsch came and filmed the Cemetery for several days studying the families from the Grigioni buried here. We had not at that date yet found the Swiss burial records which carefully list in French, written out in a beautiful hand, the canton, the occupation and the mother's maiden name of each burial. One tomb is especially endearing, where the children and grandchildren celebrate their mother and grandmother in that language quoting from the Book of Job. The linguist Noam Chomsky says a language dies if the grandparents and grandchildren cannot speak in it together. Our library within the cemetery collects books by and about the persons buried here. It begins with the Alphabet and the Bible in the original and in modern languages, including one in Rumantsch, and has books in Greek, Latin, Arabic, French, German, Italian, Rumantsch, Icelandic, Irish, Welsh, as well as a large collection on Florence and her art. We consider this a Florentine monument, a Swiss monument, an English monument, an American monument, a world monument and we seek to have it become a UNESCO World Heritage Site. People writing on it rank it only second to Paris' Père Lachaise. It deserves restoration to its former beauty and to again become world-famous. Among the guests of the English Cemetery we find first of all the most notable names of the members of the Swiss and English colonies of Florence. However, the story of the Russian colony, whose beginnings go back to the 1820's of the nineteenth century, is linked to this place. 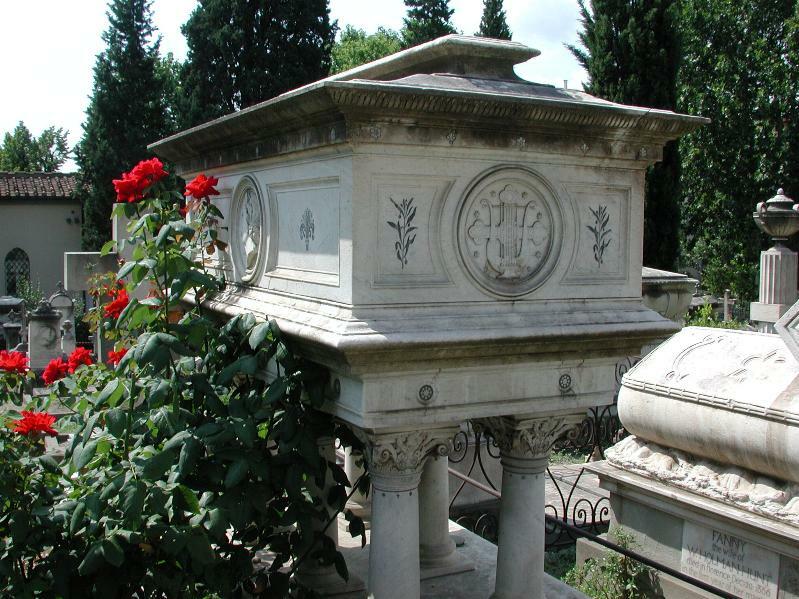 Until the Second Vatican Council Catholics considered the Orthodox Church to be schismatic: in consequence in Italy the Russians did not have the right of burial in Catholic cemeteries. The rules were particularly restrictive regarding burials of non-Catholics in the Papal States. poignant verses, speaking of his burial 'under the sweet myrtle of Italy', and the Russian ambassador at Rome A. Ja. Italinskij, buried at Livorno with a solemn funeral ceremony. 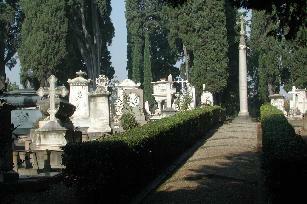 With the institution of a non-Catholic cemetery at Florence in 1827 the situation changed. Naturally the Russian tended to want to bury their dead in their own country and the English Cemetery sometimes served as a temporary resting place for the body before its being transported to Russia: this for instance was the case with Michail Zaseckij. And with that of Eugenie Jesakoff de Kraft. In particular the representatives of aristocratic families who had their morturay chapels in Russia preferred to transport their loved ones there. However many of them remained for ever in Italian soil. And if there were no difficulties with the burial, in Catholic cemeteries, for those Russians who had converted to Catholicism, the Orthodox could instead find eternal peace only in cemeteries opened by Protestants. In the English Cemetery during the period of its fullest activity, there came to be buried in all 50 members of the Russian colony. In large part these were representatives of the higher classes who came to Italy to cure themselves together with their servants: among these last we remember Kasincev, or the Nubian Kalima, baptized Orthodox with her new name 'Nadezhda', 'Hope'. In the nineteenth century Florence became a major stopping place on the Grand Tour for the European cultural elites, among them the Russians. Many artists established themselves here for a long time: among these for example the painter Zeleznov, whose daughter rests in the Florentine cemetery, or the artist originally from Riga, Edvard Bosse, who settled at Florence with his family. The vast Russian Empire was the country not only of citizens of Russian origin, concerning whom our register gives witness, but also those of German, Finnish, Polish, Moldavian origins. The Cemetery closed in 1877, but more than a hundred years afterward it opened its gates again to welcome under the cypresses of the Piazza Donatello the famous Russian choreographer Evgenij Poljakov for whom Italy became a 'second country'. We thank Mikhail Talalay of the Russian Academy of Science and Gino Chelazzi for this entry and their research on our Russian burials. This blog is to suggest ideas for your participation. Planting ideas and roses and lavender. About suggestions for the 'English' Cemetery so it can again become beautiful. (What we call in England 'putting a bee in one's bonnet'.) 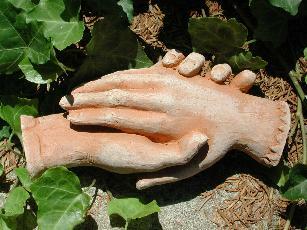 As sculpture garden, a poetry garden, that the world could help create in Florence. 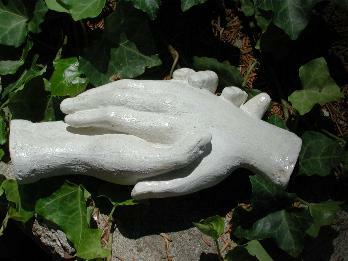 We have been talking about our sculptress friend Amalia Ciardi Dupré who has sculpted for the Emergency Appeal the 'Clasped Hands' of Elizabeth and Robert and whose ancestors made the statues of St Zenobius and St Reparata on the Duomo's facade and the statues of St Francis and St Clare in San Rufino in Assisi as well as sculptures of Cain and Abel for the Czar in the Hermitage. There is no statue in Florence to Beatrice. I asked Amalia for a Dante and Beatrice in Paradise that we could place in the niche at the other end of this cemetery which would be seen by all Florence's traffic in the viale. Our sculptress created this model which could be then made life-size for 10,000 euro. (I think Beatrice is putting the bee in Dante's bonnet about writing his poem, the Commedia!) Would someone like to give such a gift to Florence? In this way we would be linking poetry and sculpture. Would someone like to give such a gift to Florence? We already have Elizabeth Barrett Browning's lines from Aurora Leigh and her epitaph for Lily Cottrell incised in Carrara marble with Lord Leighton's lily beside them, given to us by the Armstrong Browning Library of Baylor University in the arch of the Gatehouse so readers may pause and read. One of my dreams is of having a second bell on the wall facing the Cemetery that we could ring when it is time to close the Cemetery, instead of only the one that is rung by people wanting us to open the Cemetery. And which we know was so rung by a descendant in 1945 coming to visit his Sewell ancestors' tombs. Our rival Cemetery has a siren. We only want what will evoke the nineteenth century so that visitors will step back in time to a more hand-crafted era of fine poetry and sculpture and the tenderness of family members to each other, memories of the past to teach the future beauty and wisdom. Why I took out the modern plastic and metal and built the library with wooden bookshelves, Savonarola chairs and damask blue and green curtains, so that one could step into the nineteenth century's appreciation of medieval and Renaissance hand-crafting. The modern traffic can swirl about us but inside there is peace and the great thick walls of the Gatehouse make the library absolutely silent. Already an American has given us iris bulbs, the purple wild iris that are the true Florence lily, which propagate happily in our cemetery's soil. A Russian gave me money to buy flowers for Evgen Polyakov's tomb and I bought daffodil bulbs and planted these, remembering that my nuns had so planted daffodils over a hundred years ago around the two tombs of their sisters buried in an Sussex graveyard and that these are now flourishing like Wordsworth's 'cloud of daffodils'. (Would someone like to bring a hundred daffodil bulbs from England and plant them here to join our Florentine purple iris/lilies?) And just today I was told by a visitor in her fifties that when she would come here as a five-year-old child with her governess there were delicious wild strawberries growing on the tombs. In the nineteenth century the Swiss-owned so-called 'English' Cemetery, with its tombs of so many world citizens, English, Swiss, Russian, Greek, Polish, Hungarian, Scandinavian, American, Australian, was a beautiful garden, with roses and jasmine climbing the wrought iron arches on children's tombs, sweet-smelling lavender, myrtle and rosemary. We would harvest the rose petals and lavender for potpourri, thus earning contributions to our restoration fund. We have begun with planting purple irises, which are Florence's lily, a gift from an American donor, beneath our great cypresses, and will separate these next year so the original bulbs can propagate. Our gardeners have given us four olive trees in pots and compost rubbish to create topsoil. White marble looks best with green. We should be most grateful for donations to this project, either funds or plants themselves, thus giving back to Florence the world's garden she once had. 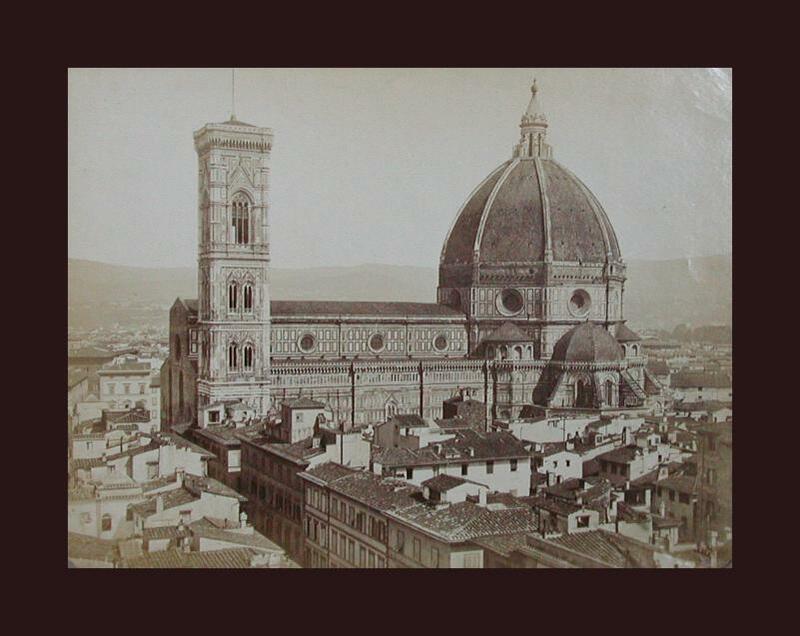 The city of Florence has become very interested in our combination of a library with the cemetery and especially in its archives, grreatly appreciating the two exhibitions of sepia photographs and of nineteenth-century books, and are incorporating the catalogues of the library and archive into their system to document this aspect of Florence's history, our international contribution to her. We have now painted the rusting iron gates at the front and the new, beautifully curving handrails on the steps leading up to them. We welcome you to enter through these gates to visit the Cemetery, where you will step from the twenty-first century with its pollution and roar of traffic, into the nineteenth century with its art, its beauty, its hand-crafted work, its peace, an island in time and in space. We welcome your participation in its restoration. 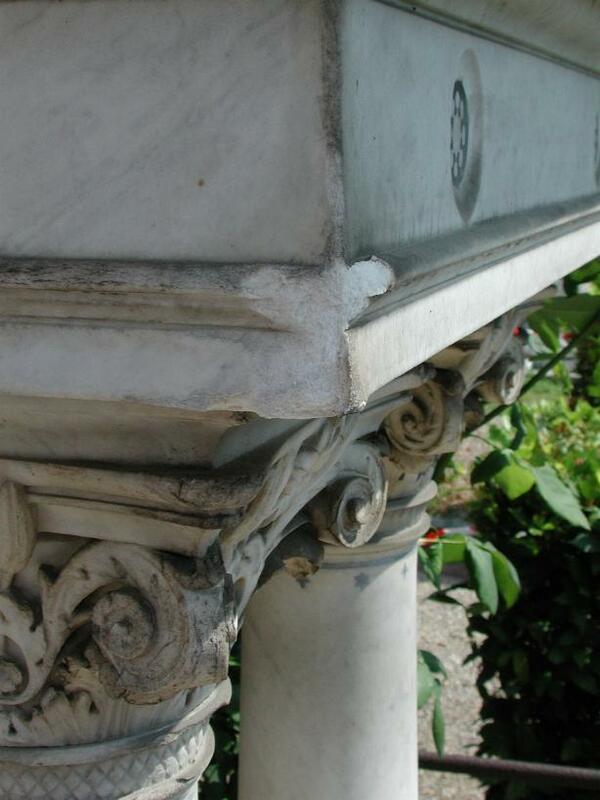 Elizabeth Barrett Browning's famous marble tomb is crumbling and urgently needs restoration. It was designed by Frederic, Lord Leighton, who had studied at Florence's Accademia di Belle Arti and who became President of the Royal Academy of London. Emily Dickinson wrote about it, having treasured a postcard photograph of it. Alberto Casciani of Meridiana Restauri, who studied with Florence's Opificio delle Pietre Dure, has given us an estimate for its restoration. If there are individuals and organizations interested in participating in this project we should be delighted. I invite you to the Swiss-owned so-called `English` Cemetery in Piazzale Donatello, where we have the tombs (habeas corpi) of Elizabeth Barrett Browning, Walter Savage Landor, Arthur Hugh Clough, Isa Blagden, five members of the Trollope household, Fanny, Theodosia Garrow Trollope, Joseph Garrow, Harriet Fisher and Elizabeth Shinner their maid, Hiram Powers, Joel T. Hart, several participants in the Battle of Waterloo, several friends of Florence Nightingale, and many others. We also have a library, with books written by and about these persons and others, and a workshop where we sculpt Elizabeth and Robert`s `Clasped Hands`, bind books by hand, marble paper, etc. We have two exhibitions in our Gatehouse: one called `Florence in Sepia`, a collection of nineteenth century photographs that were almost burnt in a bonfire by the nuns in my convent, bought by my Mother Foundress in the nineteenth century and taken back to England, illustrating the places written about by Elizabeth Barrett Browning, George Eliot and Anna Jameson; the other an exhibition of some of our books: Isa Blagden, Poems, 1873; Elizabeth Barrett Browning, Lady Geraldine's Courtship, n.d; Sonnets from the Portuguese/Portugalske sonety, trans. Hanna Zantovska, 2001; Sonnets and Ballad (including Hiram Powers` `Greek Slave`), 2004; Aurora Leigh, 1866; The Old Yellow Book: Source of Browning's The Ring and the Book, 1908; Joel Hart, Triumphant Woman; Mrs. [Sophia Peabody] Hawthorne, Notes in England and Italy, 1872; Anna Jameson, Legends of the Monastic Orders as Represented in the Fine Arts, 1891; Walter Savage Landor, Imaginary Conversations, 1886; Frederic Leighton, engravings for George Eliot, Romola; Mrs Oliphant, The Makers of Florence: Dante, Giotto, Savonarola and their City, 1914; Frances Trollope, Domestic Manners of the Americans, 1974, Paris and the Parisians in 1835, 1836; Vienna and the Austrians, 1838; Thomas Adolphus Trollope, What I Remember, 1887; Lilian Whiting, Kate Field, 1900, A Study of Elizabeth Barrett Browning, 1902. 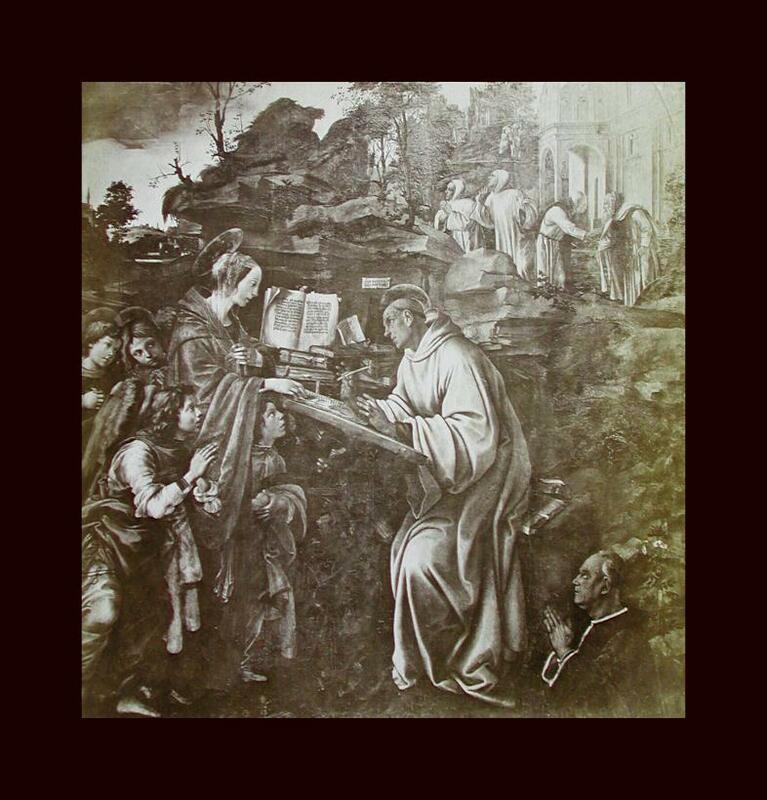 We have Anna Jameson, Legends of the Monastic Orders, open to the engraving of Filippino's Vision of the Madonna to St Bernard in the Badia, below the sepia photograph of that same painting, which had been in the Palazzo Strozzi at the same time that we exhibited these photographs in the Gabinetto Vieusseux there. We have as well a portfolio of Lord Leighton's painting of the procession through Borgo Allegri of the Cimabue Madonna, and of his engravings for George Eliot's Romola. Membership in Aureo Anello (referring to the `golden ring` of Elizabeth Barrett Browning`s verse between Italy and England on the Casa Guidi plaque) is through giving its library a book and these books in the exhibition have been given by members from all over the world. We are open Monday mornings, Tuesday-Friday afternoons and you can ring our bell at other times. We are in the midst of an Emergency Appeal to prevent the `English` Cemetery from being closed and abandoned. You can read about it here and sign the petition `That the English Cemetery be kept open, be restored and be declared a UNESCO World Heritage Site`. 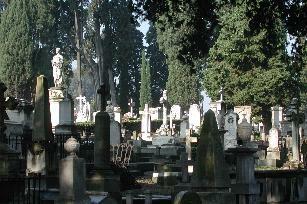 The English Cemetery is in Piazzale Donatello, Florence, Italy. In 1827 the Swiss Evangelical Reformed Church purchased land outside the medieval wall and gate of Porta a' Pinti from Leopold II, Grand Duke of Tuscany for an international and ecumenical cemetery, Russian and Greek Orthodox burials joining the Protestant ones. Prior to that date non-Catholics and non-Jews who died in Florence could only be buried in Livorno. 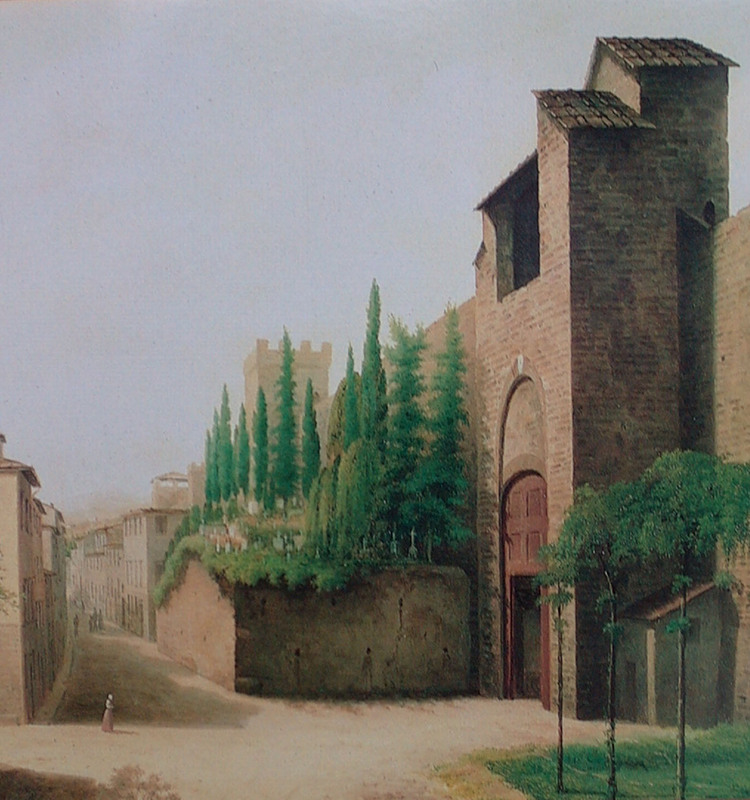 Carlo Reishammner, as a young architectural student, first landscaped the Swiss-owned, so-called 'English' Cemetery, then Giuseppe Poggi shaped it as its present oval when Florence became capital of Italy, surrounding it with great studios for artists, including that of Michele Gordigiani, who painted the portraits of Elizabeth Barrett and Robert Browning, now in the National Portrait Gallery, London. Many famous persons were buried here, Elizabeth Barrett Browning (in a tomb designed by Frederic Lord Leighton), Walter Savage Landor, Arthur Hugh Clough, Fanny Trollope and her daughter-in-law Theodosia Garrow Trollope and three other family members, Isa Blagden, Southwood Smith, Hiram Powers, Joel T. Hart, Fanny, the wife of William Holman Hunt in a tomb he himself sculpted, Mary, the daughter of John Roddam Spencer Stanhope in a tomb he himself sculpted, Louise, sister to Henry Adams, whose dying he describes in his 'Chaos' chapter in The Education of Henry Adams, two children of the Greek painter George Mignaty, whom Robert had paint Casa Guidi as it was when Elizabeth Barrett Browning died there, and Nadezhda De Santis, a black Nubian slave brought to Florence at fourteen from Jean-François Champollion's 1827 expedition to Egypt and Nubia, while the French Royalist exile Félicie de Fauveau sculpted two tombs here. Giampietro Vieusseux, Swiss, the founder of the Gabinetto Vieusseux of which John Ruskin, Fyodor Mikhailovich Dostoevsky, and Robert Browning were readers, is also buried here and likewise the Swiss historian Jacques Augustin Galiffe, who with Jean Charles Léonard Simonde de Sismondi pioneered genealogical, archival research. 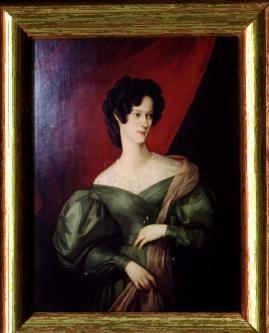 Emily Dickinson treasured a photograph of Elizabeth Barrett Browning's tomb and wrote 'The soul selects her own society' about it, using lines also from EBB's Aurora Leigh. While Elizabeth Barrett Browning wrote a sonnet on Hiram Powers' sculpture The Greek Slave, which had been at the center of the Crystal Palace Exhibition. Isa Blagden and Theodosia Garrrett Trollope, part East Indian, part Jewish, are models for Miriam in Nathaniel Hawthorne's The Marble Faun, while George Mignaty's wife is model for the head of Hiram Powers' Greek Slave. The cemetery is famous, too, as the partial subject of Arnold Boecklin's Island of the Dead, from its burial of his seven-month daughter, Mary. In turn, the composer Sergei Rachmaninoff made use of the painting for his Op. 29, The Isle of the Dead. The cemetery itself is a kind of encyclopedia memorializing the creativity of western culture, from America to Russia, from Scandinavia to Nubia, during Italy's Risorgimento. Of the many Swiss, Russians and Americans buried here, the English graves are the majority as their community in Florence in the nineteenth century was the largest. The tomb inscriptions are in Hebrew, Greek, Cyrillic, fraktura and Roman scripts, and in many languages, Hebrew, Russian, French, German, Danish, Rumantsch, English, including passages of the Bible in their vernaculars, at that period forbidden to Catholics. In 1877, the Cemetery had to be closed, the medieval wall having been torn down at the Risorgimento when Florence became capital of Italy, and Code Napoleon, from Roman law, forbidding burials within city limits. At the present day ashes may be interred. Currently, research is being carried out on the burial records in England, Russia and Italy, these being published on the web, the library in the cemetery seeks books written by and about the persons buried here, and an Emergency Appeal is underway to restore the 'English' Cemetery in Florence after 125 years of neglect and abandonment to its former beauty described in Victorian guidebooks and seen in early sepia photographs, particularly those taken by Hiram Powers' son, Longworth Powers, now in the Gabinetto Vieusseux. Earlier we said we were garnering support with the petition, which is doing well and which also reflects our international Swiss-owned 'English' Cemetery in Florence, the signatures coming from all over the world. The Italian newspaper, L'Espresso, expressed amazement that we had so many signatures in so short a time. Because we have two petitions going for UNESCO to have it be a World Heritage Site, we are now only 300 signatures short of the thousand for which our thermometre aimed. Now it is time to seriously raise funds. Aureo Anello has already given 1000,00 euro for the handrails to help the elderly and infirm access the Cemetery. If we can keep this Cemetery open and have it be restored, there are people willing to purchase lots, 70 centimetres by 70, for the burial of their ashes. We now have eight such requests. It is Catch 22. They will complete these requests only if the Cemetery is to remain open and to be restored. The Cemetery can only remain open and be restored if we can convince its Swiss owners that it is viable for them economically. For too many years it had been their 'White Elephant'. Why their decision to close and abandon it completely. We also have the promise of the city and regional governments' participation in the total restoration project if we can also obtain private participation, your participation. It shall be possible to recreate what was once a most beautiful monument in Florence and even to spend eternity here, alongside world-famed writers, artists, doctors, preachers, people who helped end slavery, who helped end diseases, who created immortal poetry. Louise Jury in The Independent and an anonymous writer in The Florentine are writing fine newspaper stories about the need to save the 'English' Cemetery in Florence from being shut down and abandoned. Piazzale Donatello. The Municipality: 'We will save it'. In common parlance it is the 'English' Cemetery, but the official name is the 'Protestant Cemetery'. The problem, nevertheless, is elsewhere: the beautiful complex which rises in Piazzale Donatello, in the midst of the city's traffic, lately has fallen on hard times. The Cemetery's hill - constructed in 1827 by the Pinti Gate and owned by the Swiss Evangelical Reformed Church - is subject to continual landslides (see the newspaper's photograph), causing the foundations of the ancient tombs to be uprooted, and allowing the entry of water, further compromising the hill's stability. And the trees are suffering, weeds are sprouting and spreading everywhere, the tombs showing decades of neglect. It is a shame, a crying shame. To save it will require a radical restoration and a sum of money that at the moment will be difficult to raise. But perhaps things are beginning to change. Yesterday, the Minister of Culture for the Municipality of Florence, Simone Siliani, together with experts from the Municipality, visited the monumental complex to see for themselves the problems that had so often been brought to their attention. A quick tour and an idea: the place could be saved and the Comune, this time, could play a fundamental role. 'Even if', as Siliani immediately added, 'a private property were involved and, according to the law, the work of maintainance of such a heritage was the responsibility of the owner'. Two days ago we had met with the Regione Toscana, the government of Tuscany, who explained that they cannot help a private commercial owner, unless he/she consents to work through a non-profit charitable cultural association such as we already are. Yesterday we initially met with the Swiss who own the Cemetery, asking that they allow this project on behalf of the English Cemetery in Florence Foundation and the Associazione Aureo Anello Biblioteca e Bottega Fioretta Mazzei e Amici del 'Cimitero degli Inglesi' to proceed. If we can restore the 'English' Cemetery to the garden it once was we know that the Swiss will be able to sell grave plots for interring ashes. At present the Cemetery is too barren and desolate for people to want to do so, despite being so famous. Near this Piazza (Massimo D'Azeglio) lies the old Protestant Cemetery of Florence, once beyond the Porta Pinti, and under the shelter of the ivy-covered walls, both of which have been included in the recent demolitions. The greater number of the tall old cypresses which crowned the summit of the mound have been cut down, and the picturesque beauty, as well as seclusion of the spot, which were so congenial to the feelings of mourning friends, no longer exist. It is now protected by a neat iron railing, within which have been planted cypresses and various shrubs, which it is to be hoped will, in time, restore some of its former beauty. The mountains of Vallombrosa and Fiesole are not quite shut out by the row of houses rising on all sides, and the order and care bestowed by the municipality, into whose hands it has fallen by purchase, leave no room for complaints. The white marble monuments, to each of which is attached a little garden of roses or other flowers, give a peculiar loveliness to this cemetery, far removed from gloom, and in the spring-time, the remains of the departed seem to repose under a shower of sweet blossoms. Among the monuments raised to those whose names are known to the world, may be mentioned Elizabeth Barrett Browning, Arnold Savage Landor, Mrs. Trollope and her accomplished daughter-in-law, the poet Arthur Hugh Clough, and the American divine Theodore Parker'. When Elizabeth Barrett Browning died, Italy's government had placed on Casa Guidi a plaque that said she made of her poetry a 'Golden Ring' between Italy and the English-speaking world. The Aureo Anello Associazione Biblioteca e Bottega Fioretta Mazzei e Amici del Cimitero 'degli Inglesi' (Golden Ring Association Fioretta Mazzei Library and Workshop and Friends of the English Cemetery), which is formed under Italian law, can receive funds in dollars, pounds and euro to be applied directly to urgent projects such as restoring the great wrought iron gates (we are currently scraping away their rust and painting these ourselves), and such as acquiring lavender and rosemary shrubs for creating hedges to keep people from walking amongst the now-dangerous tombs. We have re-created, thanks to the sculptress Amalia Ciardi Dupré, Harriet Hosmer's 'Clasped Hands' of Elizabeth and Robert Browning. We have also printed in William Morris type and hand bound in our own marbled paper, a limited and numbered edition of Elizabeth Barrett Browning's Sonnets and Ballad. These would make excellent wedding gifts, either separately or together. Donations for them will help pay for the 'English' Cemetery's restoration and maintenance. in dollars, euros, pounds. Please include an amount to cover postage. In June 2004, together with the Gabinetto Vieusseux and in the Palazzo Strozzi at the same time as the Botticelli and Filippino Exhibition there, we had held an international conference on Florence's English Cemetery. Nic Peeters and Judy Oberhausen were participants. The papers can be read at http://www.florin.ms/gimel.html etc. I just want to say that Judy Oberhausen and I very much appreciate your work to preserve the ‘English Cemetery’. The cemetery will always retain an aura of magic for me, because of the strange way that I first came to visit it. It was on a hot Saturday afternoon during the summer of 2003 and I was treating myself to a ramble around Florence after a rather fruitless search for evidence of the Pre-Raphaelite painter John Roddam Spencer Stanhope’s presence in Florence throughout the last decades of the 19th century. I arrived at the cemetery’s gate completely by coincidence and was immediately tempted to visit the famous tomb of Elizabeth Barrett Browning. Then I noticed a small sign on the gate saying that the cemetery was closed on Saturdays. For a reason that is still not completely clear to me, I whispered a little prayer to my favourite painter, Evelyn De Morgan, who was Spencer Stanhope’s niece. As by miracle the gate opened at once to let you and Assunta out. I asked if you could overlook the house-rules just for once and let me take a quick peek at EBB’s tomb. It was very close to EBB’s tomb that I then found the grave of Mary Spencer Stanhope, the painter’s young daughter, designed by himself: my first piece of strong artistic evidence of the artist’s presence in Florence! The rest of the story you probably remember well. You invited me into your lovely library and after my head had stopped reeling I explained to you the wonderful discovery I had just made. Upon hearing this you asked me to deliver a paper on Mary’s tomb at the international conference you were organising. In June 2004 I gave this presentation together with my regular research/writing partner and pillar of strength Judy Oberhausen of San Mateo in California (another ‘coincidence’: this was where you had lived for years!). Julia, we both wish you success with your campaign to save the ‘English Cemetery’, which is a treasure trough of information for art history scholars, and if there is anything we can do to support it, please do not hesitate to let us know. We are gathered here today at an English Tea to celebrate a neglected Florentine international monument, the Swiss-owned so-called ‘English’ Cemetery. Its land was bought by the Chiesa Evangelica Svizzera, the Swiss Evangelical Church, from the Grand Duke in 1827, the same year that the Grand Duke agreed to fund Jean-François Champollion and Ippolito Rosselini's expedition to Egypt and to Nubia. Visit Florence's Archeological Museum to see what they brought back. In 1877, with the medieval wall and the Porta a’ Pinti torn down by Giuseppe Poggi, the Cemetery itself was re-landscaped into this oval, a gardener installed in this house, itself built in 1860. For a century and a quarter more the small Swiss church in Florence owned and cared for this ‘white elephant’. Five years ago they paid half a million euro towards the repair of the wall built originally by the Comune. Though they were given permission for the burial of ashes, such as Evgeni Polyakov's, the derelict state of the cemetery has not encouraged many such burials. Finally the Swiss committee said ‘enough’. It was recommended it be closed and abandoned. But we had formed a cultural association, with the aid of Carlo Steinhauslin, first for our library and workshop, the Biblioteca e Bottega Fioretta Mazzei, and then to include the Friends of the Cemetery, now named Aureo Anello Associazione Biblioteca e Bottega Fioretta Mazzei e Amici del Cimitero ‘degli Inglesi’, ‘Aureo Anello’ being taken from the plaque on the Brownings’ home, Casa Guidi, in via Maggio, saying that Elizabeth Barrett Browning made of her poetry a golden ring between Italy and the English-speaking world. When the members of the Aureo Anello heard about the closure of the cemetery and the loss of the library and workshop they immediately responded. In particular, we need to restore this cemetery’s Victorian tombs and to landscape it back to the English garden it once had been. We have photographs of the Cemetery as it was with the medieval wall and gate still beside it, taken by Hiram Powers’ son, Longworth Powers, and recently discovered in the Gabinetto Vieusseux. We have Susan and Joanna Horner’s Walks in Florence telling us it was filled with fragrant flowers. With top soil to replace the present weed-killed earth we can again plant lavender and roses and myrtle and laurel and make pot-pourri to give to you. For it was high time that we English lived up to our part of the name of this place (I was conceived at the League of Nations, Geneva, Switzerland, and born at Devonshire Place, Marylebone, where Elizabeth Barrett Browning lived) and that we pay our debt of gratitude to this city that has inspired so many writers who are buried here, Elizabeth Barrett Browning, Walter Savage Landor, Arthur Hugh Clough, Fanny and Theodosia Trollope, Isa Blagden, and two Pre-Raphaelite artists who sculpted tombstones here, Holman Hunt’s for his wife Fanny who died in childbirth, and John Roddam Spencer Stanhope’s for his daughter Mary, both tombs besides Elizabeth Barrett Browning’s. Immediately the Browning Society, the Victoria Society, Andrew Motion, the Poet Laureate, and Timothy Wilson of the Ashmolean Museum lent their support. We seek to become a UNESCO World Heritage Site. Nor should we forget that we have more than eighty Americans buried here, among them fine sculptors, and Consuls, Hiram Powers having been both, and preachers and writers against slavery, and Louisa, sister to Henry Adams. And we have many Russians, princes and serfs together, buried as Pushkin wrote under the sweet myrtle of Italy. Many scripts and multiple languages are found here. Many children, many women who died in childbirth, and many friends of Florence Nightinagale lie here. Each tomb has a story to tell, which we have placed on the web, thereby gathering more stories from descendants and scholars world wide. 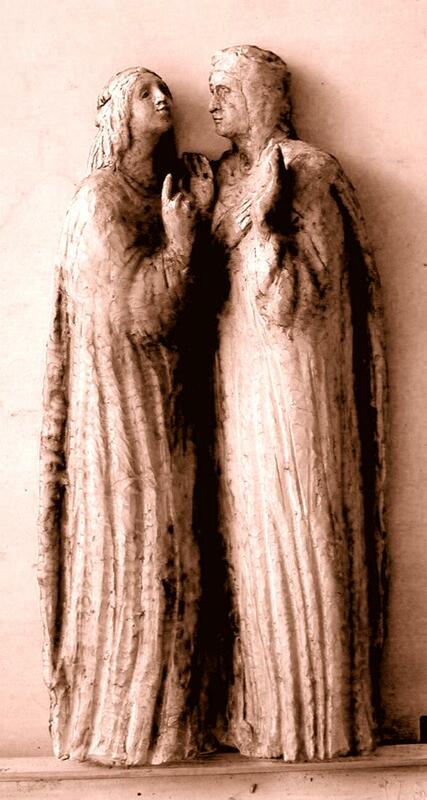 We have the fine sculptures of ‘Speranza’ and ‘Fiducia in Dio’. And most poignantly of all, buried under a most beautiful Orthodox cross in Carrara marble with Cyrillic inscriptions on its base is Nadezda, who was brought here at fourteen, in the year of the Champollion, Rossellini Expedition, from Nubia, a black slave, baptised ‘Speranza’. We can again allow this Cemetery to flourish and be a place of freedom and hope and love and beauty - with your help. We immediately need to replace the red and white plastic tape with wrought iron posts and chains, while regretting the current dangerous state of the Cemetery. Several tomb stones have fallen, one, of a Polish patriot, right by a group of schoolchildren, so we can no longer permit unaccompanied visitors to walk amongst the tombs. We have books, in particular the limited edition hand bound in marbled paper edition of Elizabeth's Sonnets and Ballad, CDs of Florence in Sepia and other items for sale to benefit the Cemetery, including Linda White Terzani’s Soul Traveller which she can autograph for you. Amalia Ciardi Dupré has re-created Harriet Hosmer’s famous ‘Clasped Hands’ of Elizabeth Barrett and Robert Browning and we can take orders for these. Those of you representing countries of those buried here, Switzerland, America, Russia, Poland, Hungary, Greece, Denmark, Holland, Australia, could tell us which Foundations to approach for the restoration of their tombs. However, we cannot begin to collect funds for this historic landmark until the Chiesa Evangelica Riformata Svizzera in Florence agree not to close and abandon it. I've been meaning to email you in thanks for the 'Florence in Sepia' CD, for which I'm very grateful. What a fabulous resource! Your appeal about the Cemetery to the Victoria list deeply distressed me. The Cemetery must not be allowed to close. It is a wonderful momument to the vibrant culture of foreigners in Italy, and the artistic, literary and political importance of the 'golden ring' connecting Italy with Britain and other nations. For several years I've been researching the expatriate women poets known to the Brownings in Florence, and their important contributionboth to Risorgimento politics and the British poetical tradition. Two of the most interesting and talented women poets of the Brownings' circle, Theodosia Garrow Trollope and Isa Blagden, rest in the 'English Cemetery', and it would be a disgrace if the achievements they represent were forgotten. The Cemetery is a tribute to many talented men and women who imagined a future for Italy, and the Cemetery itself deserves to be respected and treasured, and given a secure future of its own. I'm hoping, at Kitty Ledbetter's suggestion, that a presentation and appeal can be made at the Barrett Browning conference next Easter. In the meantime, please let me know if there is anything else I can do to support this worthy campaign. I was appalled to hear of the impending closure of the English Cemetery, and welcome your initiative in taking action to keep it open. It is such an important cultural landmark in Florence that you deserve strong support. I should be very happy to be on your Honour Committee, and, once you have decided what action to take, I should like to help in any way I can. I would like to thank you for your e-mail. I am pleased to transfer it to my colleagues in charge of World Heritage in Europe. Thank you for your support to the World Heritage Convention. I wanted to express my support and gratitude for the work you and others are doing for the English Cemetery, which is so valuable on many levels. The site is not like any other, and contains a wealth of cultural and historical information that we cannot not lose. Because I live as a historic site caretaker (in Connecticut), I understand how hard it is to address many different preservation/interpretation issues at once. Might I suggest that if the friends group finds funds to purchase basic landscaping equipment and supplies, one way to save money is to design a one- or two-week spring landscaping project for volunteers. Volunteer projects of this sort happen all over the world, and there are people out there who would love to spend a week working in the cemetery. Such a preservation project could include lectures and tours and participants might even be charged a nominal fee. There are many possibilities in this arena. If you would like any assistance in arranging such a volunteer project, please let me know. I would love to help the English Cemetery, in whatever form I can. My Master's paper was on James Jackson Jarves, whose first wife lies in the English Cemetery (he himself lies in Rome). Florence's glorious 19th century history must not die! I have updated our record for the English Cemetery as per your request, and have also added a new record for the home page of the 'Florin' site as a whole. Good luck with the restoration campaign! 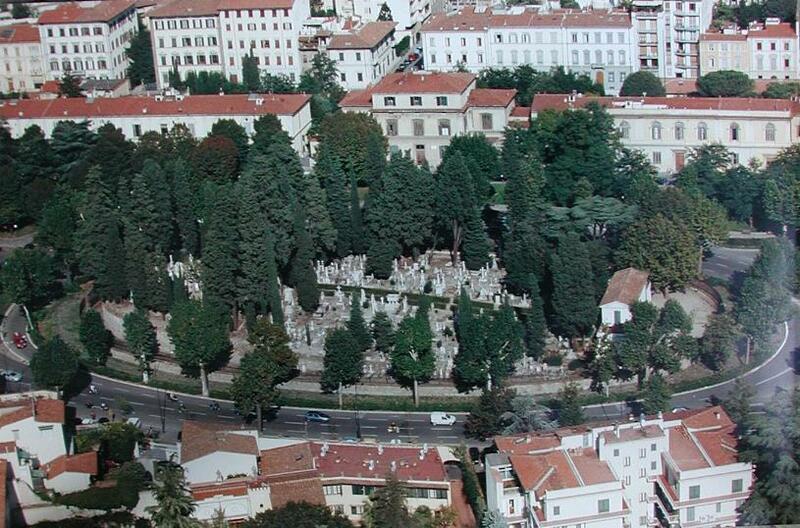 On Tuesday, 14 June, we shall hold an English Tea in Florence's 'English Cemetery' to launch its Emergency Appeal. We shall read the messages of support sent from interested persons. We request the honour of your presence at an English Tea to be held in the Swiss-owned, so-called ‘English’ Cemetery, Piazzale Donatello, Tuesday, 14 June, 2005, from 6:00-7:00 p.m. * * * Siamo lieti di invitare la S.V. a un Tè all’inglese nel Cimitero Evangelico Svizzero, detto ‘degli Inglesi’, in Piazzale Donatello, martedì 14 giugno 2005, dalle ore 18.00 alle ore 19.00. I do agree most wholeheartedly that the English Cemetery in Florence should not be closed without further consultation and without the careful consideration of other alternative sources of financing. I am sure that there would be widespread dismay amongst both academic specialists and general enthusiasts if such an important historical site were to close. I send the Browning Society's support for your efforts to at least delay this process until all concerned can consider possible solutions. . . . I feel sure that our membership would wish to join in your campaign in any way you feel could be useful.